STRUM ‘n’ SING ALONG – Monthly at The Ukulele Place at The Rhythm Inlet. Everyone’s welcome! Come strum, sing, toe tap, percuss, or simply relax & enjoy the music & merriment of some nice folks. OPEN MIC – We’ve got the sound system, whether a work-in-progress or polished piece, we welcome you to present your latest inspiration! So that he knows what to set up, please let Jeff know ahead of time. Call 941-966-5800, or post your request here on the RSVP page. SOCIAL – A brief schmooze with refreshments on the premises during a break might happen. But every time for sure, several folks go out for food & drink in the ‘hood afterwards. You’re invited to all of it! 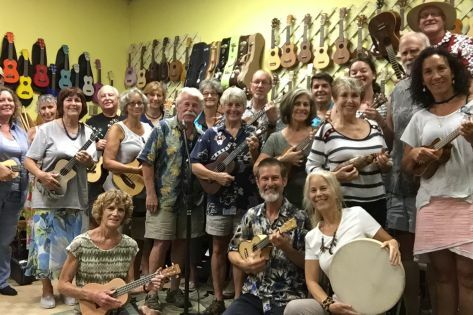 NOTE – The Suncoast Sand Fleas is a ukulele Meetup group that organizes & enjoys many other uke-related activities in the area, as well. And we have a presence on 2 websites: Meetup & Facebook. Stay updated with The Suncoast Sand Fleas on Meetup & Facebook!